When theme is submitted, email is sent which contains minimal information. We can add some additional info so that it could help author himself/herself can check their theme against the guideline. May be it will help making theme approval faster. Thank you for uploading THEME_NAME to the WordPress Theme Directory. If your theme is selected to be part of the directory we'll send a follow up email. 1515.diff​ (3.7 KB) - added by rabmalin 2 years ago. Want to know about Theme Review Process? See this <a href="https://make.wordpress.org/themes/handbook/review/">link</a>. Here's my pass at it. Used much of @rabmalin's original content, but also added some. Feedback welcome. Your theme is now in the Theme Review queue waiting to be reviewed by a member of the ​Theme Review Team. You can check your status in the queue at any time by following ​this link. Once your theme gets to the top of the queue, it will be assigned to the next available reviewer. This reviewer will ensure that your theme is ready to go into the Wordpress.org theme repository. Your theme will be checked against the Theme Review Guidelines and at the very least, your theme will need to satisfy all the ​required theme checks. In addition, there are also ​recommend points that include best practices in WordPress theme development. Your theme will not be rejected if it does not meet all of these requirements, but they do represent best practices that should be followed if possible. Once a reviewer has had a chance to take a look at your theme, they will post a comment on the ticket indicating any changes that need to be made based on their review. For the review to move forward, you will need to fix those issues and ​re-upload your theme. You will continue collaborating with the reviewer in this way until all issues are resolved. Once you are assigned a reviewer, it's important to stay active on the ticket. If the reviewer does not hear from you within 7 days, the ticket will be closed as not-approved. If you need more time to make updates, you should let the reviewer know on the ticket. Likewise, if you don't hear from the reviewer for more than 7 days, you can ask an admin in Slack to put your theme back into the queue. See ​this link to register in Slack and make a post in the #themereview channel. When the reviewer approves your theme, it will be sent to an admin for final review. You can view your position in the admin queue ​here. After approval by an admin, your theme will then be allowed in the Wordpress.org theme repository. We frequently get asked "Why does it take 3 to 6 months to get a theme approved?" The simple answer is that there are many more themes submitted than there are reviewers to review them. You can help to reduce this time by making sure you review all the required and recommended checks before submitting your theme. In addition, if you want to become a reviewer, the Theme Review Team is open to anyone and you can ​easily get started. If you have questions throughout the review process, you can ask the reviewer on the ticket or join us in Slack and ask in the #themereview channel. I find the text too long. We need to make it shorter. We can link to another page which explains the process in more detail. It would be better to replace "see this link", "this link" & "here" with a better title. e.g. 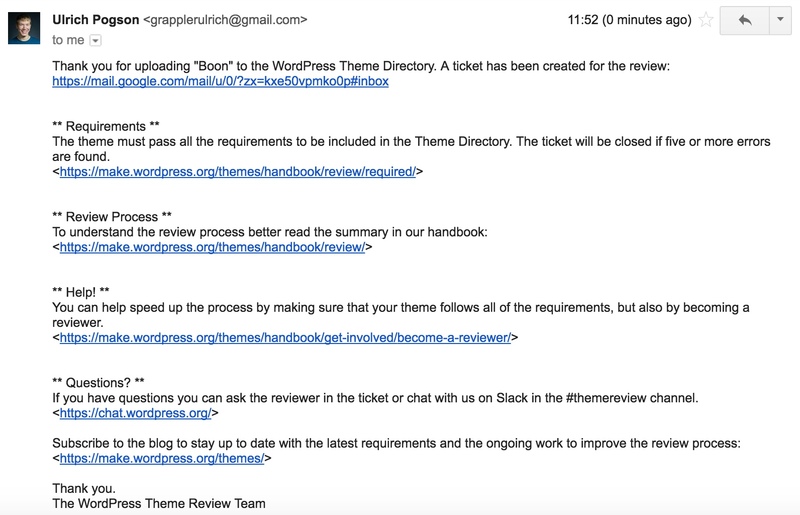 "Theme Review Process", "review queue", "join the WordPress Slack" & "admin queue"
The theme reviews are done by volunteers. You can help speed up the process by joining the Theme Review Team and doing reviews yourself. Your theme is now in the Theme Review queue waiting to be reviewed by a member of the ​Theme Review Team. You can ​check your status in the queue at any time..
Once your theme gets to the top of the queue, it will be assigned to the next available reviewer. Your theme will be checked against the Theme Review Guidelines and at the very least, your theme will need to satisfy all the ​required theme checks. Throughout the process, reviewers will post comments on the ticket indicating changes that need to be made. You will need to fix those issues and ​re-upload your theme. You and the reviewer will collaborate in this way until all issues are resolved. Once your theme is being reviewed, it's important to stay active on the ticket. If you need more than 7 days to make updates, you should let the reviewer know on the ticket, otherwise the ticket will be closed as not-approved. When the reviewer approves your theme, it will be sent to an admin for final review. You can ​view your position in the admin queue at any time. After approval by an admin, your theme will then be allowed in the WordPress.org theme repository. Theme reviews are done by volunteers. You can help speed up the process by ​joining the Theme Review Team and doing some reviews yourself. I’m sorry if I sound negative, but I feel that authors are required to read the guidelines before submitting a theme. The first part of the text makes it sound like reading the guidelines is optional. Thank you for uploading THEME_NAME to the WordPress Theme Directory. Your theme is now in the Theme Review queue. You can ​check your status in the queue at any time. Once your theme reaches the top of the queue, it will be assigned to the next available reviewer. You will be notified by e-mail when the review starts. Your theme will be checked against ​the Theme Review Guidelines and it needs to pass all the requirements to be included in the Theme Directory. Throughout the process, the reviewer will post comments on the ticket indicating changes that needs to be made. You will need to fix those issues and ​re-upload your theme via the upload page. You and the reviewer will collaborate in this way until all issues are resolved. During the review, it's important to stay active in the ticket. If you need more than 7 days to make updates, you should let the reviewer know, otherwise the ticket may be closed as not-approved. When the reviewer approves your theme, it will be sent to an admin for a final review. You can also ​view your position in the admin queue. After approval by an admin, your theme will be published in the WordPress.org Theme Directory. Theme reviews are done by volunteers. You can help speed up the process by ​joining the Theme Review Team. If you have questions you can ask the reviewer in the ticket or ​join us on Slack and ask in the #themereview channel. Looks good to me. I like how you tightened up the copy a bit and removed that ambiguity. You should really have a text/plain fallback with any text/html email (although not everyone does). Until WordPress supports nicer HTML emails, perhaps you can reword it not to use <a href> links and instead just use inline links? Thank you @rabmalin for working on this again. As it is plain text I feel it should be shorter so that people read it. I made a few changes. See the screenshot below how it would look like in the email. There needs to be some information on how to update the theme, since it is not obvious to first time authors. It is one of the most common questions. Good idea. Here is the latest text. The theme must pass all the requirements to be included in the Theme Directory. The ticket will be closed if five or more errors are found. You can update your theme any time and it will get added to the ticket. You can do so by uploading the new zip file. You can help speed up the process by making sure that your theme follows all of the requirements, but also by becoming a reviewer. Is it possible to add a note about the accessibility-ready process *if* the theme carries the accessibility-ready tag? We could use in_array( 'accessibility-ready', $this->theme->get( 'Tags' ) ) to check if the theme is using the a11y-ready tag before adding the extra text. You can update your theme any time and it will get added to the ticket. You can do so by bumping up your theme's version number and uploading a new ZIP file. You can help speed up the process by making sure that your theme follows all of the requirements. You can also help by becoming a reviewer. For translation purposes, could we keep to a single email without branching? If you've submitted a theme with the accessibility ready tag, it will go through a secondary review process to meet accessibility guidelines. You can update your theme any time and it will be added to the ticket. You can do so by bumping up your theme's version number and uploading a new ZIP file. I just made minor updates in text. The theme must pass all the requirements to be included in the Theme Directory. The ticket will be closed if five or more different errors are found. You can update your theme any time and it will be added to the ticket. You can do so by bumping up your theme's version number in your style.css and uploading a new ZIP file. Perhaps the Help! is not appropriate, it is a headline people would look for when they need help, not when they want to learn how to contribute. Ok, I think we are nearly there. I change the title from help to contribute. I think we can include the a11y text in all emails and improve on it again in the future. Theme Directory: Update the post-submit-theme email with more details of what Theme Authors should expect. Props grapplerulrich, rabmalin, kkoppenhaver, poena, joedolson, juhise, dd32. I've gone ahead and updated the version currently sent out, as this looks pretty good to me, and it's been a week without other alterations. I'm leaving this ticket open in the short term as it appears there may still be some small tweaks that others may want to be made. Yeah... That doesn't look amazing. I'm assuming it's too much of a pain to send an HTML email, but maybe we can play around with formatting a bit more. I think == might be better than **, for example. And putting the URLs at the end of each paragraph (but still part of them) could be beneficial, depending on screen size. And putting the URLs at the end of each paragraph (but still part of them) could be beneficial, depending on screen size. I prefer it this way more. One thing I did see was having the a11y text all in one paragraph. In the snippets above there were two lines of space between the paragraph. I feel that help would add a bit more white space. We could do a once-off for this if someone wants to write up a patch for it, but a text-only fallback would still be needed. The double paragraph spacing was causing a bit of weirdness for me, but I can't recall what the actual problem was. Forcing that is easy enough though. What's the consensus for the rest? Links inline, use some other format for headings? Did anybody tried to add * around the headings (instead of ** Requirements ** just *Requirements*)? I've read that some email clients can interpret that as bold (and _ as underline). Also I'd remove <> around the links, looks odd to me. Plain links are fine.